In a world where objects are really people, a boy runs away from the only home he's ever known. When the boy unwittingly parts with an object, not realizing its full value, he sets the wheels in motion for a wild adventure. Author and illustrator Edward Carey has crafted a wildly imaginative tale which occurs in a fanciful place where even garbage takes on a life of its own. Deeply suspenseful and refreshingly unique, Carey's second book in the Iremonger series reads well as a stand-alone, but the stage is well set for the continuation of this incredibly engaging read. There are those occasional children's books which seem to pull you in so swiftly and splendidly you barely have a sense of the world around you. 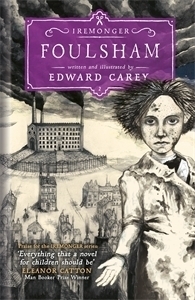 Foulsham is one such book and we found it to be quite mesmerizing and delightful in every way.